We offer many varied services at One Vision Signs and we pride ourselves on being able to supply our clients with personalised products, which we engage with from the ideation stage, right through to install. With this at the centre of our ethos and an increasing demand from our clients for more CNC routed based products, we made the decision to invest in a Tekcel VSR CNC flat bed router of our very own. Our new CNC router features ‘ballscrew servo-drive technology’ and a highly efficient ‘tool changing system’, which means for us it’s an unbeatable combination of versatility, productivity and ease of use. Plus, as a result of this it means less operation time for setting the files and machining the material, which gives us the ability to offer a fantastic CNC routing service at a very competitive rate. Built to handle just about every sheet material you care to mention and widely used for every application you can imagine, it’s ideal for the varied requests we receive from our client’s daily. We use a range of materials such as dibond, foamex, acrylic and wood so whether it be supply only for you to install yourself or part of your signage requirements, we can do it all! Having the router as an addition to our arsenal of machinery enables us to engage with a new range of diverse clients and workflow because we can cut materials in ways we couldn’t before. 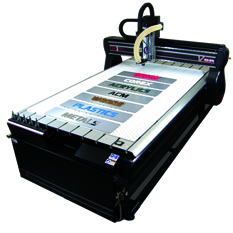 Gone are the days of cutting all sheet material with a knife in only the basic square and rectangle shapes. It has not only allowed us to cut sheet materials in any shape but has also opened up a huge range of sheet materials that otherwise would not be possible for us to cut with our trusty knives. After years of using a trade supplier for our routing, this has now given us at One Vision Signs the ability to have greater control over the production, lead times and quality of all our signage due to being able to manage these services directly. Our trained staff operates and oversee the projects at all levels, meaning you will get the promise of quality with every product. In the past few months, our new toy, the CNC Router machine, has strengthened our fabrication department immensely and allowed us to control complete projects under our own roof. Along with our wide format printer and vinyl cutter, we are proud to say that we are now able to produce over 90% of our client’s requirements in-house, which helps us to keep our prices low and lead times tight. In turn, it simply means happy clients. Have any questions about what our new CNC router can offer you? Or find something of interest on the lists below? If so, we’re happy to answer your queries, just get in touch.